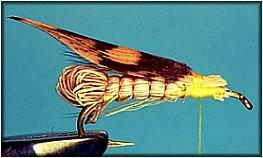 Fly Angler's OnLine "Beginning Fly Tying Part 32"
Before we go too far, I'd like to finish our hoppers with a look at one more great fly. We'll be spending the next few weeks spinning and stacking hair, and leaving hoppers without tying the Henry's Fork Hopper would be a crime. Although it doesn't have a spun deer hair head, and spinning hair is where we were and where we'll be going for a while, I think we need to look at this fly before we continue along. Consider it a side step if you will; a necessary look to the side as we travel the road of hair spinning and manipulation. The Henry's Fork Hopper uses a bullet style head. The head is still created from deer hair, but instead of clipping and shaping the hair, it's folded back and tied down to form a bullet shaped head. I think you'll find this style of head useful and durable. Mike Lawson gets the credit for creating this great pattern that uses deer and elk hair for most of the body, wing and head. Since the hair is hollow, the fly floats because of the buoyant characteristics of the hair, not the way it rests on the surface tension of the water. If the current pulls it under, it'll pop back to the surface because it's buoyant. 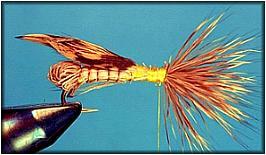 A great fly for turbulent water, but it also does very well in calm water. You'll get a look at a new tool today. 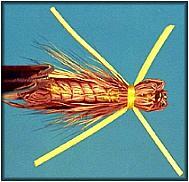 The Griffin bullet-head tool is the best item I've found to help create bullet-head flies. 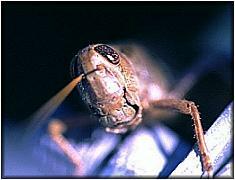 Since bullet-heads are fairly common in streamer flies, the bullet-head tool has more than one application. 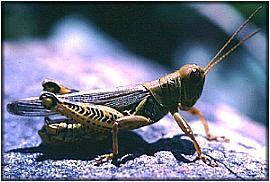 If you're looking for fast fish catching action, it's hard to beat a Henry's Fork Hopper on a windy day in late summer. You won't need a graceful landing for this fly to work, real hoppers hit the water with a plop that quickly gets the attention of any nearby fish. Hang on, I've watched fish clear the water by more than a foot to dive on a hopper that carelessly landed in the water. I can handle that kind of action. Hook: Light wire terrestrial hook. Tiemco 2302 or equivalent. Size: 4 to 14. Tail: Elk or deer hair, folded over to create a rounded tail. Under Body: Yellow thread or yarn. Over Body: Hair, the same hair used to make the tail. Under Wing: Tan elk hair, tied sparse. 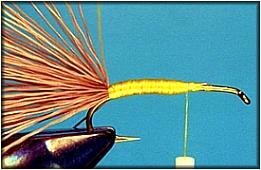 Legs: Yellow, multi-colored, black or white rubber hackle material. Head: Deer hair, tied bullet style. 1. 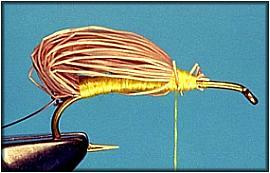 Tie down a copper ribbing wire to the hook bend. 2. 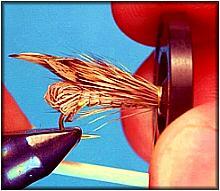 Select a medium sized bunch of elk hair, remove the under-fur, even the tips in a hair stacker and tie in by the tips. 3. Using a bodkin, fold the hair over the bodkin just behind the hook bend, hold in place, and tie off about 1/3 hook shank length behind the hook eye as shown. 4. Trim the excess hair at the front of the body. Also trim any stray strands of hair or broken hairs. 5. Rib the hair down into a segmented body. As you get better at this, you can take a wrap of wire behind the hook bend first to create a tighter tail, but the fish don't mind this tail. 6. 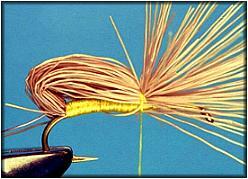 Tie in an under-wing of elk hair using the same procedure used in Al's Hopper. Trim the excess hair and wrap the ends down with thread. 7. Tie in the feather over-wing using the same procedure used in the Dave's Hopper wing. 9. Make another wrap of thread around the hook and hair, then cinch it down to the top of the hook. 10. Trim the excess hair and cover the ends down with thread. 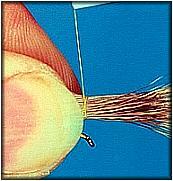 Wrap the tip portion of hair down with thread to tight behind the hook eye. Wrap the thread back to the point where the wing is tied in, covering all the hair in the head area as you go. 11. 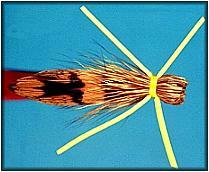 Push a bullet-head tool back over the hook eye and hair to a point just above the point where the wing was tied in. With the bullet-head tool in place, you can even up the hair around the hook. 12. Pull the bullet-head tool forward slightly and bind the hair down with thread behind the tool. 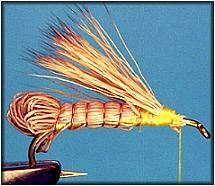 Use enough thread pressure to cause the hair to flare and to form a bullet looking head. 13. Your bullet head will now look something like this. 14. 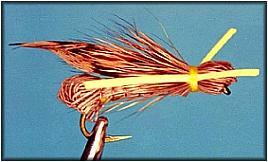 Tie in a strand of rubber hackle on each side of the head as shown. 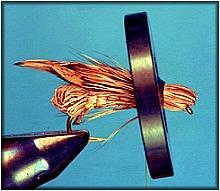 If the rubber hackle spins to a place on the hook it's not supposed to be, just stretch it and move it back into place. 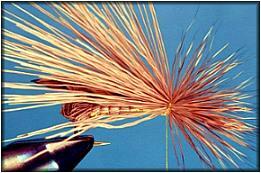 When you let the rubber hackle go, it will expand and stay in place. 15. Whip finish the head and cement. After the cement has dried, lift the rubber legs above the body, hold them together as pairs (front and back) and trim to length. The rear legs should extend to the back of the body, and the front legs should extend slightly beyond the head. 16. Bottom and top views of the finished fly. Experiment with different colors of deer hair if you like. 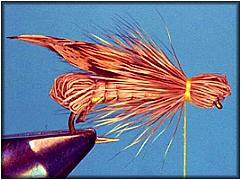 Like other hopper patterns, this one can also be tied in cricket, stonefly and cicada colors. If you fish this fly you'll discover what Mike Lawson and I already know; it catches fish.